ARY Group and Bahria Town on Wednesday signed an agreement to build a gated housing community in Karachi. 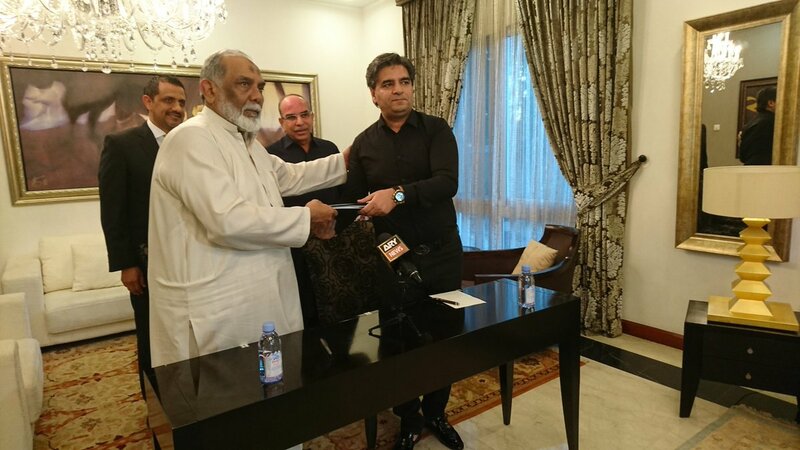 The agreement in this regard was signed by ARY Group Chairman Haji Iqbal and Bahria Town’s Country Head Shahid Mehmood Qureshi in the presence Chairman Bahria Town Malik Riaz in Dubai. The gated housing community named ‘ARY RESIDENCIA’ will consist of 300 villas, a mosque, school, hospital and a 50,000 capacity cricket stadium. It will be a part of Bahria Town Karachi Sports City Project. “We have longstanding relations with Bahria Town and we have seen their successful journey. We used to wonder sometimes in Dubai as to when will our country see similar development but when we see Bahria Town Karachi, we can say that our country too is getting similar development projects,” Chairman ARY Group Haji Iqbal said on the occasion. He also expressed hope that international cricket will return to the country through the stadium which will be a part of ARY RESIDENCIA. Chairman Bahria Town Malik Riaz, on the occasion, said that he prays for the smooth completion of the project and he will be happier if this project surpasses the regular standards of Bahria Town’s construction quality. Bahria Town’s Country Head Shahid Mehmood Qureshi congratulated Haji Iqbal for becoming the first private investor to build a housing project in Bahria Town. Why they will have gated community inside Bahria town gated project. ..does it not make the current customers feels that the current security facilities which Bahria town claim is not sufficient? ?? It’s mean VIP inside the VIP gatted community This Pakistan not Dubai can’t change minds we need to suffer and suffer even whatever we are,,¡!!!!!!!!!! Is it like government within a government? Why there is need of gated community within Bahria Town? Inshallah in the 1st week of January 2018 launching ceremony will be held .For more Info contact Sayed Khurram Abbas 03343652152. Requested to plz get some charm for lower middle class family. Coz there is nothing for poor people in Bahria Town Khi. which Precincts of BTSCK are included in ARY RESIDENCIA PLAN? Which precint in BSC, When booking will be open, what will be the villa size, installment cost, Any ETA for project start up.. Any update will be appreciated. When are you going to allot plot numbers to the remaining applicants of Bahria Town Karachi.In 2017 or 2027 like Awami Villas.